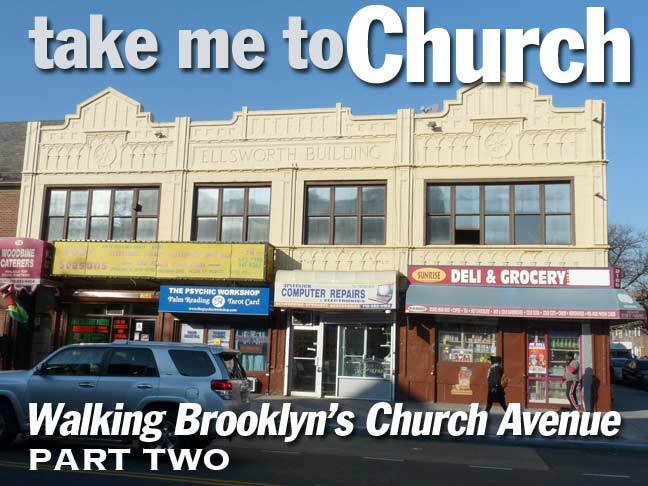 I had just arrived at the former Kenmore Theater and Beverly Hills Bridal at East 21st Street, a mere block west of Flatbush Avenue, which with Church forms one of Brooklyn’s busiest crossroads. But we are also at the site of Brooklyn’s oldest religious congregations. 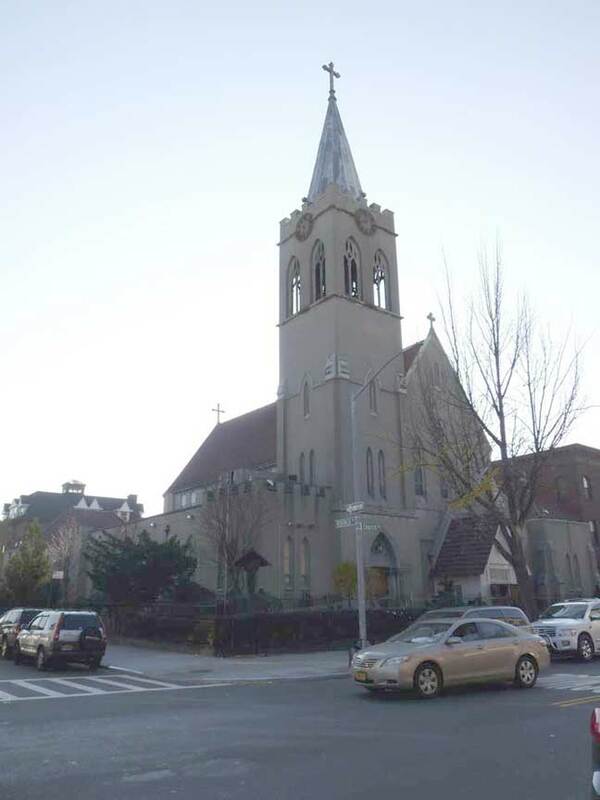 There’s been a church at the location of Flatbush and Church Avenues since 1654, the very beginnings of the village. Flatbush Dutch Reformed has had three incarnations: a wood structure built on orders from Governor General Peter Stuyvesant in 1654, a stone building in 1699, and the current one built from Manhattan schist dating to 1798. The churchyard goes back to the church’s very beginnings and contains stones inscribed in both English and Dutch. Among the many stained glass windows are a few by Louis Comfort Tiffany. 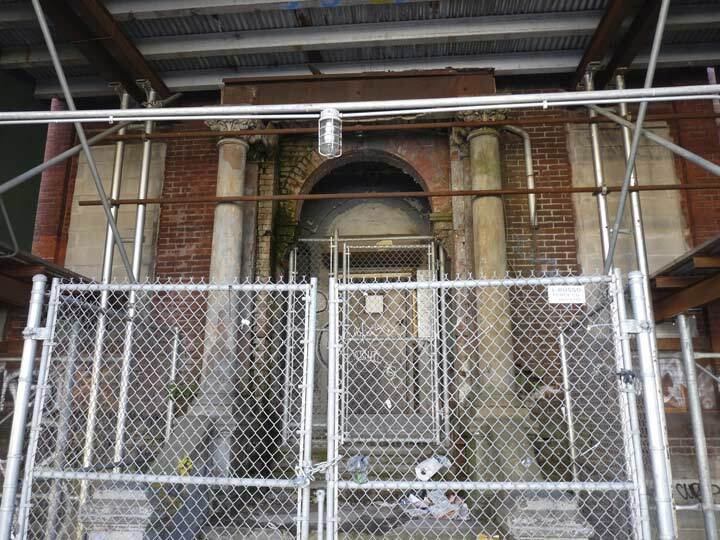 The tower contains a clock and bell that are dated 1796, plus a 10-bell chime that was cast by the Meneely Foundry of Troy, N.Y., and installed in 1913. The church bell has tolled the death of every U.S. President. It also offers services in Spanish and tailors services for the local Ghanaian believers. Surprisingly I found the Flatbush gate locked with signs indicating the cemetery was closed (“Private Property No Trespassing”) , a change from previous policies. The Church Avenue gate was open — perhaps in error — so I scurried in and out just long enough to get some photos. It would be a shame if the space was closed to the general public. Erasmus Hall High School on Flatbush Avenue, seen from Church Avenue. 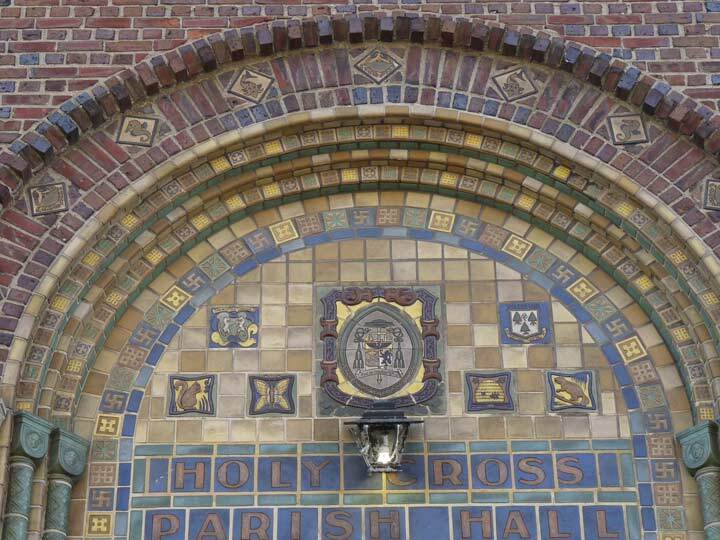 Named for Dutch philosopher Desiderius Erasmus, the school presents two historic buildings in one location. Its white clapboard Federal-style building, constructed in 1787, housed the private academy instituted by the Reformed Dutch Church across the street. 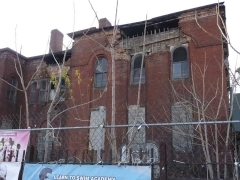 The older building isn’t visible from the street, however, since it is surrounded by the Gothic, fortress-like Erasmus Hall High School, constructed in 1905. The original academy was funded by several Founding Fathers, including Alexander Hamilton and Aaron Burr (who didn’t agree on much else). The academy became a high school in 1896: it can boast famous alumni such as pop’s Barbra Streisand and Neil Diamond, chess king Bobby Fischer, TV’s Lainie Kazan and Bernie Kopell, and opera’s Beverly Sills. The historic academy, known by students and faculty as “the white house” can usually be glimpsed from the iron gate guarding the high school. C.B. 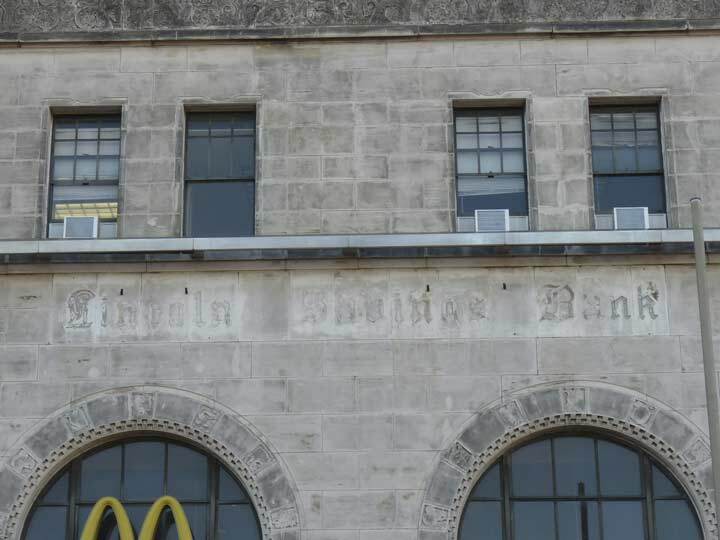 J. Snyder’s magnificent 1905-1906 building surrounds the much older original. 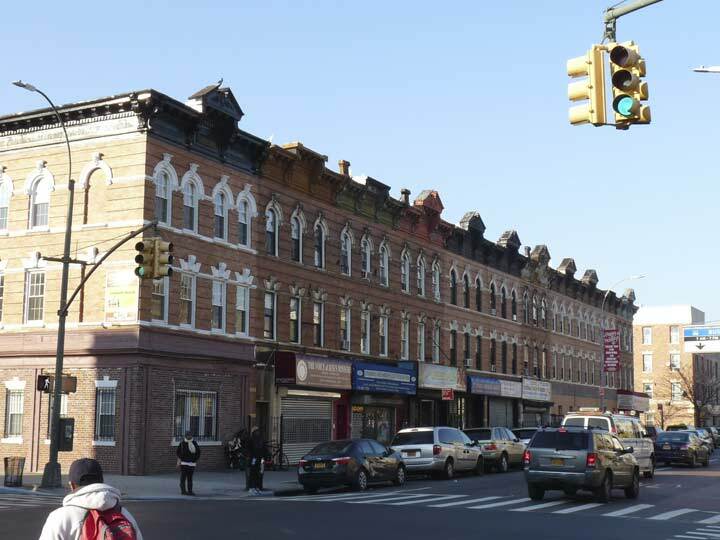 Erasmus Street and the former surrounding neighborhood, Erasmus, now absorbed into Flatbush, were named for Dutch scholar/philosopher Desiderius Erasmus (his parents named him Gerhard Gerhards, 1466-1536). A statue of Erasmus can be found outside the original academy building in the courtyard. 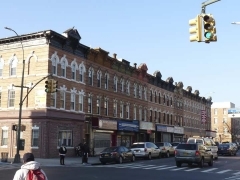 From a settlement in its beginnings in the 1650s, the crossroads of Flatbush Road and Church Lane, later Church Avenue, later became the Town of Flatbush which was absorbed into the City of Brooklyn in 1894 — only to see Brooklyn absorbed into NYC in 1898. Note that a lot of the side streets and little lanes you see on this map are mostly still in existence such as Johnson Place, Lloyd Street and Lott Street; Locust Street was absorbed into Bedford Avenue while Prospect Street became Veronica Place. 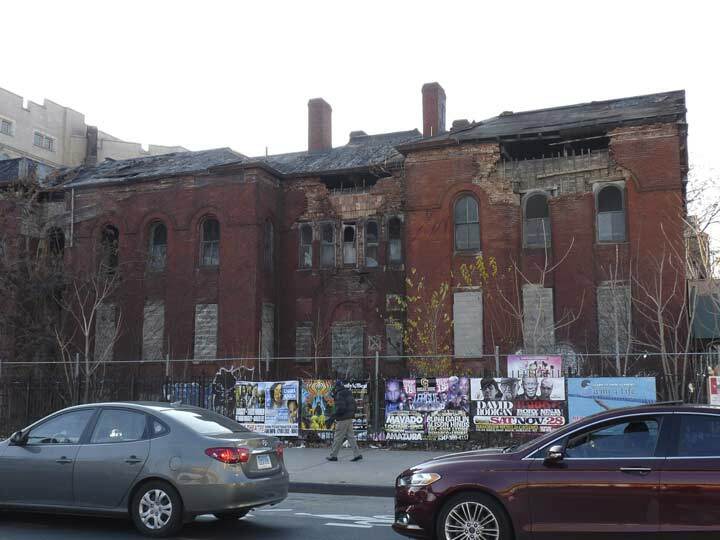 “Erasmus Hall Academy” and Town Hall, now on Grant (Snyder) Avenue, are already in place. The Reformed Dutch Church originally owned the land in the east part of town, and the individual plots had already been allocated. 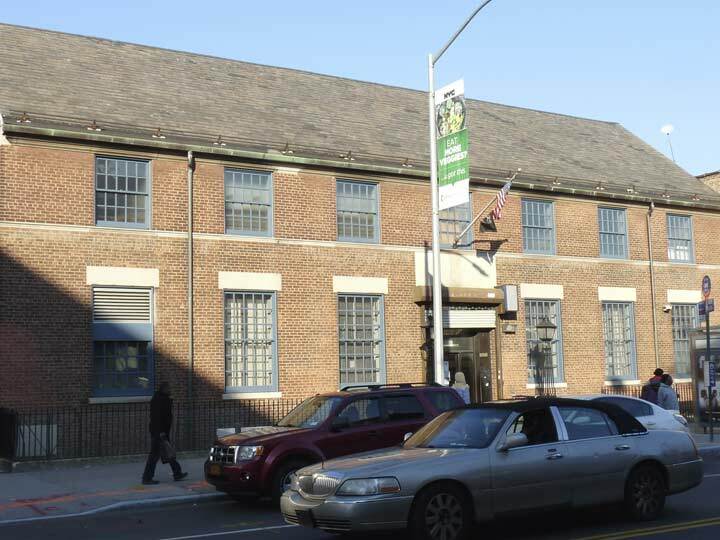 Flatbush’s post office building on Church Avenue is likely a 1930s Works Progress Administration building, but it looks as if it could have been built in the Dutch colonial era. 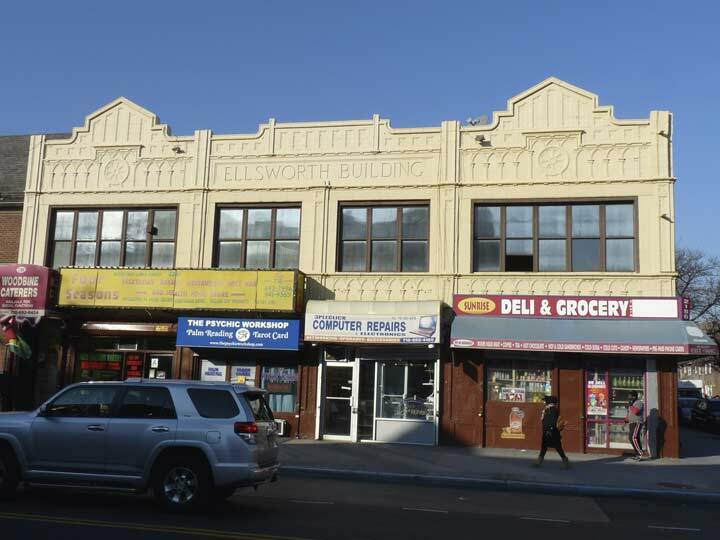 The Ellsworth Building, corner of Church and Bedford, has an amazing terra cotta exterior that has been marvelously restored in recent years. 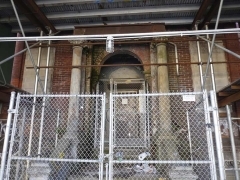 At the SW corner of Church and Bedford is a ruin in limbo. This was once the Flatbush District #1 School, later PS 90, and was constructed from 1878-1894 in a design by John Culyer, also the architect of Flatbush Town Hall on Snyder Avenue — and it’s actually a designated NYC Landmark. 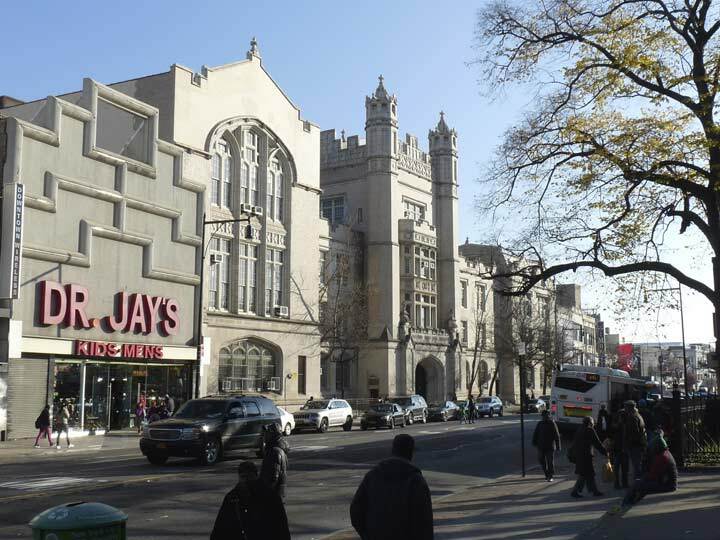 It was a public school until 1951; 3 years later it became the Yeshiva University Boys’ High School in 1968, the Beth Rivkah private Jewish school for girls. It has been empty since the 1990s. 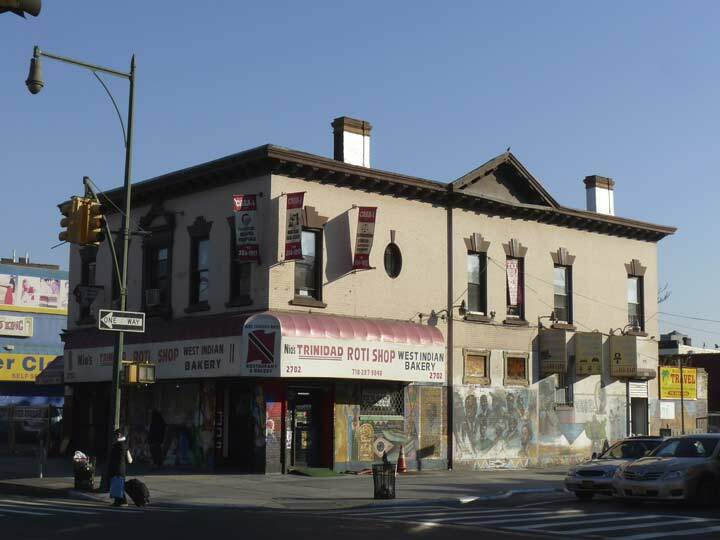 Now and then you come across a building on Church Avenue or other Flatbush streets that looks as if it was there when the neighborhood was still part of Flatbush Village. 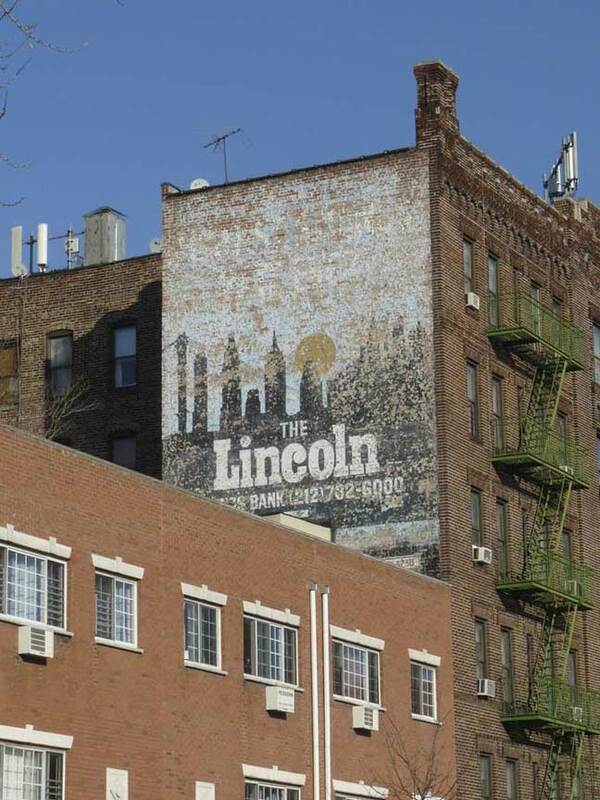 Painted ad for the Lincoln Savings Bank on Church Avenue east of Woods Place and lettered in the handsome Egyptian Bold Expanded font. In late 2015, I explored the interior of a former Lincoln Savings Bank in Bay Ridge. The Lincoln Savings Bank of Brooklyn was incorporated as the German Bank of Brooklyn in 1866 and then changed to the new name in 1917, no doubt World War I influencing that decision. The bank merged with Chase Manhattan in 1993. 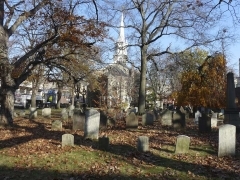 Holy Cross Church is associated with a large cemetery in East Flatbush in which the Brooklyn Dodgers’ and New York Mets’ Gil Hodges is interred as well as pre-eminent church architect Patrick Keely. 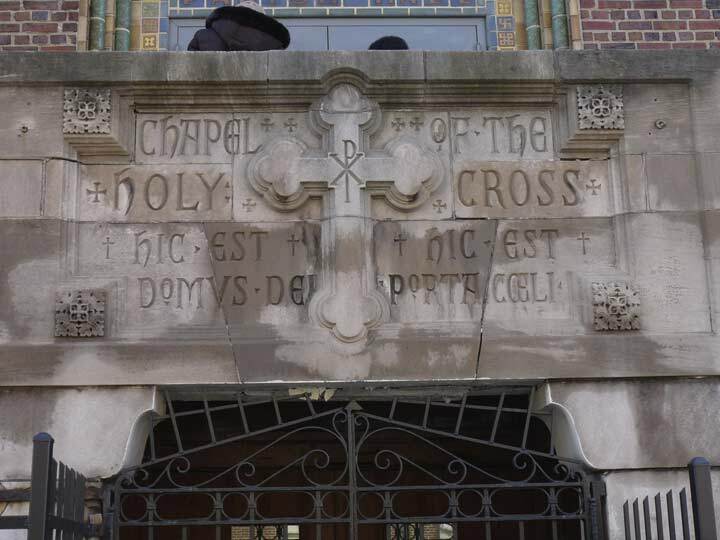 In 2011, the Holy Cross parish school became the St. Gregory the Great Catholic Academy. The present Holy Cross church building at Veronica Place, dating to the early 20th Century, is difficult to photograph on winter afternoons, as the sun is right behind it. 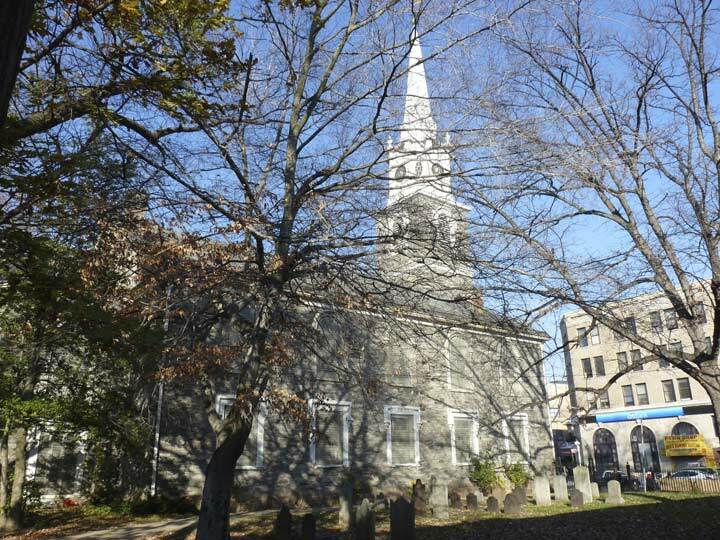 Originally Prospect Street, it was renamed in the 1940s for Sister Agnes Veronica, a principal of the parish school until her 1939 death. Though she is not mentioned in the gospels, according to church tradition Veronica was the name of a woman who witnessed Christ’s torturous procession to Calvary, carrying the cross on which the Romans later nailed him. She offered Christ her veil to wipe the blood and sweat out of his eyes, and when her veil was returned to her, an imprint of Christ’s face was left on it. At Rogers Avenue at Church there are a pair of detailed mixed-use buildings on opposite corners. 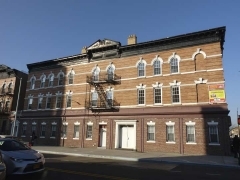 The brick-faced building is just the end unit of an impressive row of buildings that are about identical running north on Rogers that are three windows across, each surmounted by a pediment, arched windows on the third floor, rectangular on the second, and stores on the ground floor. The other is considerably older-looking and has a large pediment, a single round window, with the others featuring very large lintels. Most of the ground floor is given over to a roti restaurant; roti is unleavened flatbread served with a variety of toppings — though it originated in India, it is popular in parts of South Africa, the Caribbean and Atlantic and Pacific Ocean island nations. Dr. Yosef ben Jochannan (1918-2015), known popularly as “Dr. Ben,” was a professor in African studies, specializing in Nile Valley civilizations and their impact on Western religions; he asserted that the Jewish people, and the foundations of the Christian religion, originated in Ethiopia. 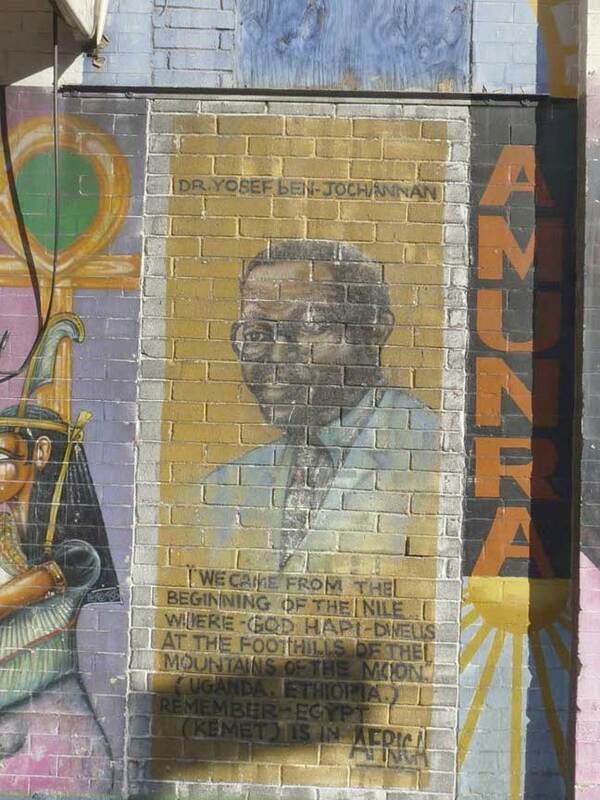 Another piece of the wall depicts Dr. John Henrik Clarke (1918-1998) a second professor of African studies and a prominent proponent of African nationalism. Interestingly, he changed his middle name from Henry to Henrik because of an admiration he had for Norwegian playwright Henrik Ibsen. 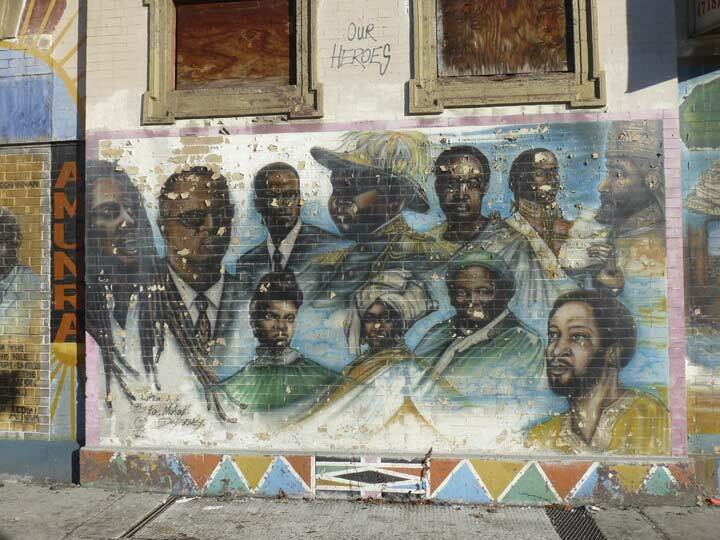 I recognize Marcus Garvey, Bob Marley and Malcolm X on this section, but somebody help me out in Comments about the others. 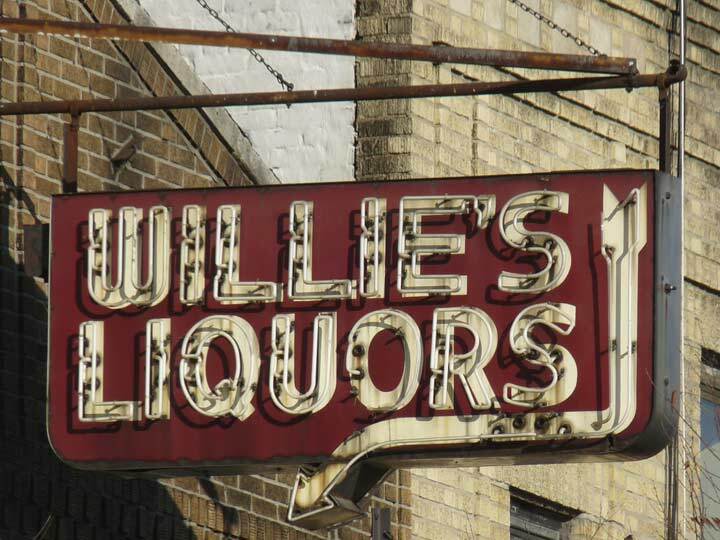 Proceeding east toward Nostrand Avenue an overhanging neon sidewalk sign for Willie’s Liquors caught my eye. One of the lost arts in New York are large (much bigger than this one) wood, plastic or neon/metal signs that overhang on sidewalks. 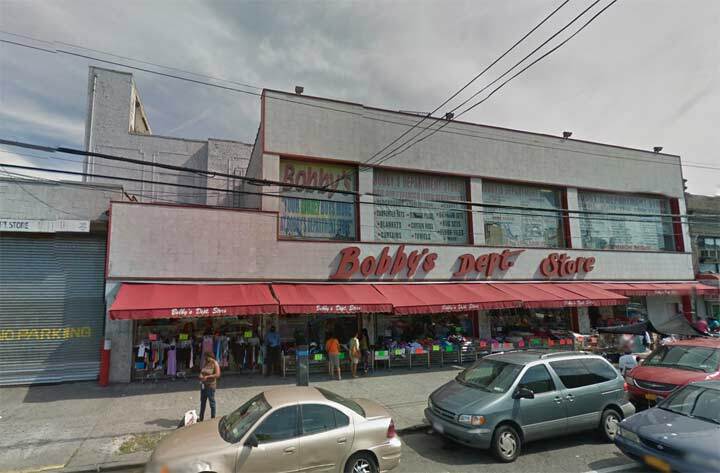 Places I have visited like Bayonne, NJ or Philly are still replete with them, in fascinating and colorful designs. New Yoprk’s advertising signage gets blander by the year as private businesses are driven out and corporations with standard logos move in. 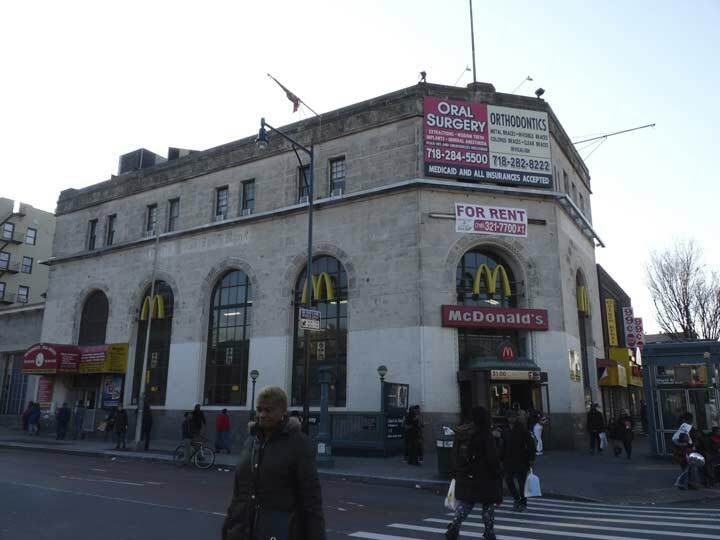 This fast food emporium at Church and Nostrand is a former Lincoln Savings Bank, likely the same one advertised on the wall ad a few blocks to the west. FNY Correspondent Gary Fonville has put together a few pages depicting other former and now repurposed banks. Apparently the entire length of Church Avenue from Nostrand Avenue to its end at East 98th is co-named for million selling reggae master Bob Marley (1945-1981) in the heavily Caribbean-American neighborhood of East Flatbush, but oddly, only two signs appear — one here at Nostrand, and the other at East 98th. 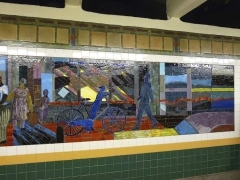 The Church Avenue station serving the #2 and #5 trains on what is oddly never called the “Nostrand Avenue Line” (even though two subway lines using 7th Avenue and Lexington Avenue in Manhattan) is the third of three subway lines with a stop on the avenue, this being the IRT entry in the series. 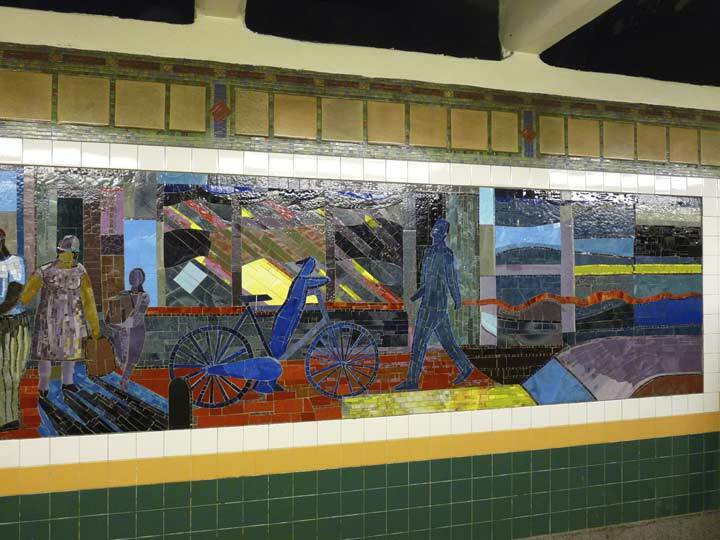 It opened August 23, 1920 along with other stops between Bergen Street and Flatbush Avenue. 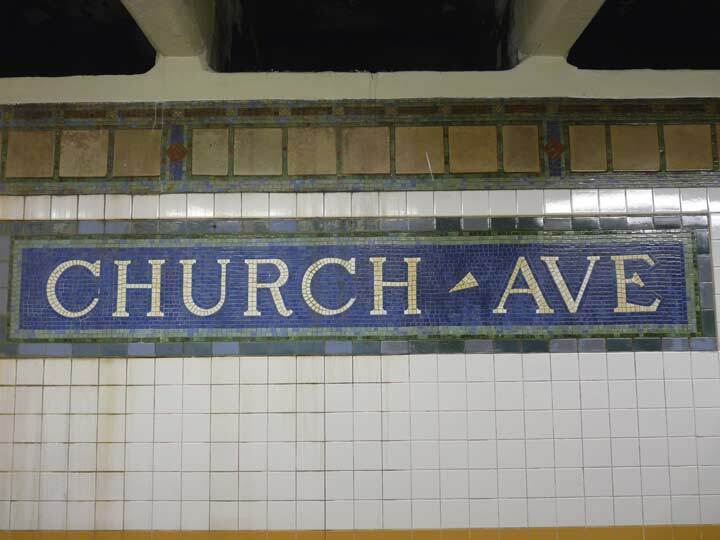 This was midway through the 1913 Dual Contracts that authorized both BMT and IRT subway line development for what were then two different companies, but designer Squire Vickers was in charge of subway signage for all stations during this time, and during this time they followed pretty much the same mosaic lettering template. A hallmark of the design is the use of a small triangle to separate words. Note that by this time the Period of Importance is mostly absent, though it can still be found on some signs but more as an abbreviation. 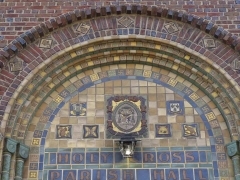 The signs themselves are a mix of blue and green here, though Vickers had some tricks up his sleeve by adding buff-colored squares at the top band. 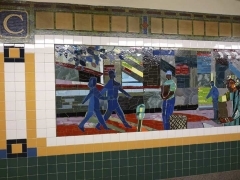 In most of the Dual Contracts stations, earth tones, green and dark blue prevail, though some stations especially on the Canarsie Line use brighter tiles. 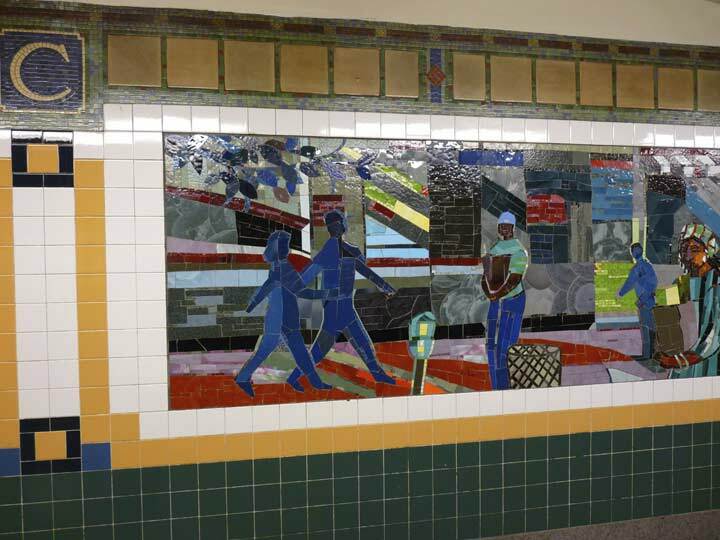 Go big or go home — I like large-scale subway art installations. 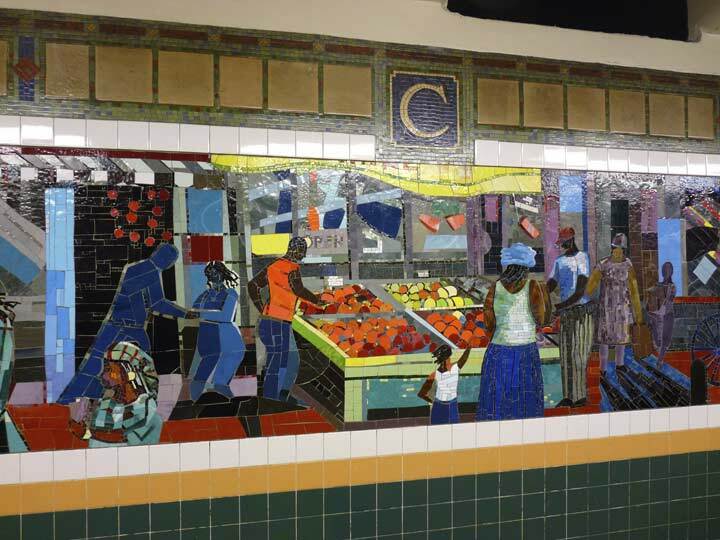 Louis Delsarte’s “Transitions,”depicting East Flatbush neighborhood scenes, has been on station walls since 2001. Delsarte, originally a Flatbusher, has works exhibited all over the USA. Do I use Google Street View? You bet I do, and I enjoy it. 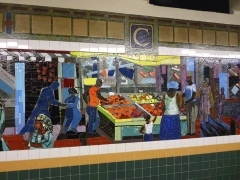 At Nostrand Avenue I ended my original walk, as I frankly felt the urge for relief, and decided to hop on the #2 train back to the clean and sanitary facilities at Penn Station. However, Google helped me complete the remainder of my Church Avenue survey. As I related in Part 1, Church Avenue is a very old conveyance going back to the Dutch colonial days as early as the 1650s. Thus, it doesn’t follow an exactly straight line and does the occasional jog north or south while its younger parallel streets were laid out in the 1800s in straight lines. 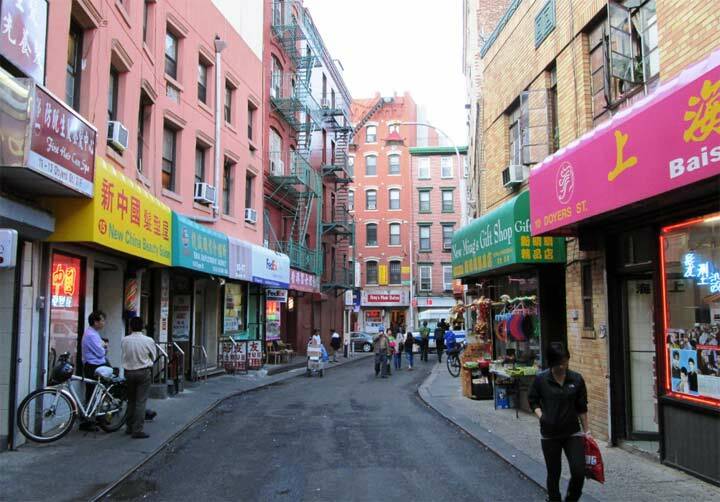 Church Avenue makes one of these slight jogs at Brooklyn Avenue (which stands in for East 36th Street). Meanwhile, at the south side of the intersection you can see a very old private dwelling that may originally have served as a farmhouse. In East Flatbush, Kings Highway is the main bailiwick of fantastical apartment buildings, but this Art Deco entry on East 37th and Church is formidable. At Church and Schenectady Avenues (which has no doubt been baffling bad spellers for over a century) there’s another streetcar relic. Previously I had no idea this decommissioned trolley pole was still here and this one is the rare bird with a crossbar that held multiple wires. Now I know it’s there because of the magic of Google Street View. The #8 (later #35) trolley plied this route, and hung in there until 10/31/56 — the last surviving surface route in Brooklyn! 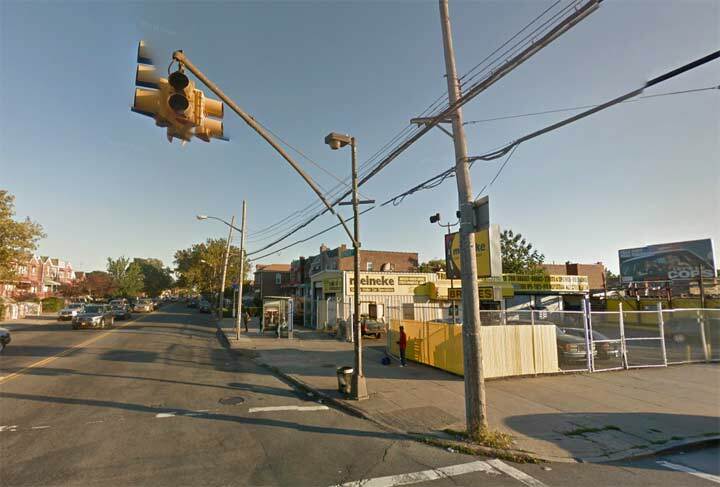 Church Avenue takes another northeast wobble at Utica Avenue (which runs south in place of East 50th Street). I had thought this terra-cotta faced building was either a movie theater or an old Child’s restaurant, but I found none of the usual ichthyic decorations like seahorses or Neptunes usually found on Child’s. I have to file it as a mystery for now. However, on Utica just north of Church are the remnants of the former Rugby Theatre, now a department store. The Rugby Theatre stood on Utica Avenue just north of Church Avenue. It opened in 1926 and was designed by architect Harrison G. Wiseman. It was equipped with a Robert Morton 2 manual 3 rank theatre organ. It also had a roof garden theatre which seated 722. 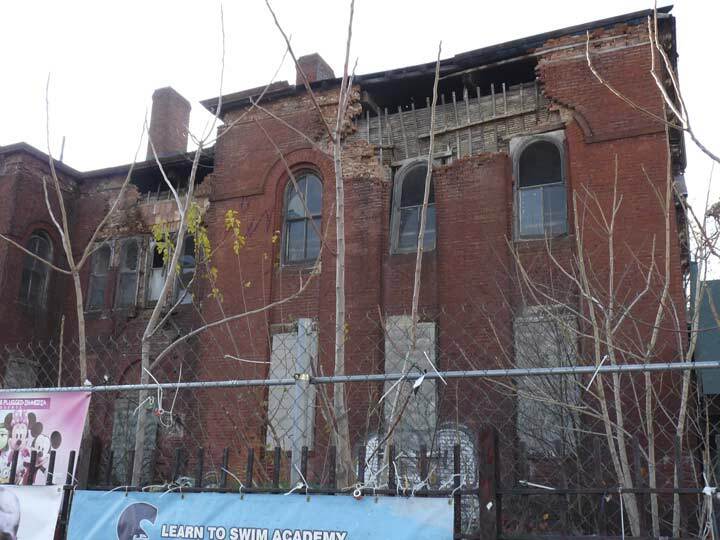 Alterations were carried out in 1932 & 1933 to the plans of architect Eugene DeRosa. Operated by the Brandt Theatres chain, it was taken over by the Golden Theater chain in the early-1970’s and operated as a dollar theater. Then it went showcase run, before being twinned in 1976 by seperating the balcony. Since Church Avenue passed Rugby Road in Park Avenue South several miles ago, you may wonder why the theater carried this name. Rugby was the name of an early 20th Century development in these parts formerly known as Ford’s Corners; in the 1800s, it rated a stop on the Long Island Rail Road on what became known as the Bay Ridge Branch, which extended between the Fresh Pond Yards in Glendale, Queens and the Narrows waterfront at 65th Street with a branch going south to Manhattan Beach. All passenger services on that line ended in 1924. Rugby has been absorbed into East Flatbush and northern Canarsie. This Kings County map shows Church Avenue’s easternmost extent in 1890. Note that slight dipsy-doo at Utica Avenue that was referred to. An old road that has left no trace intersected Church avenue at where Utica Avenue would eventually be built. The purple line at the right is Kings Highway. 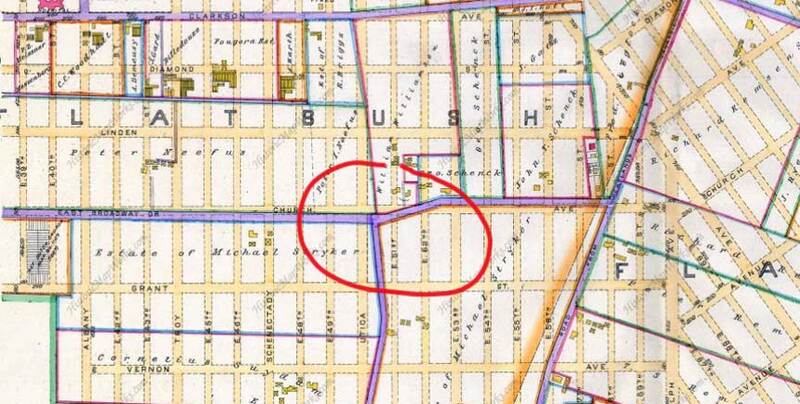 It also marks the irregular boundary of the towns of Flatbush and New Lots. Kings Highway just north of Church Avenue. 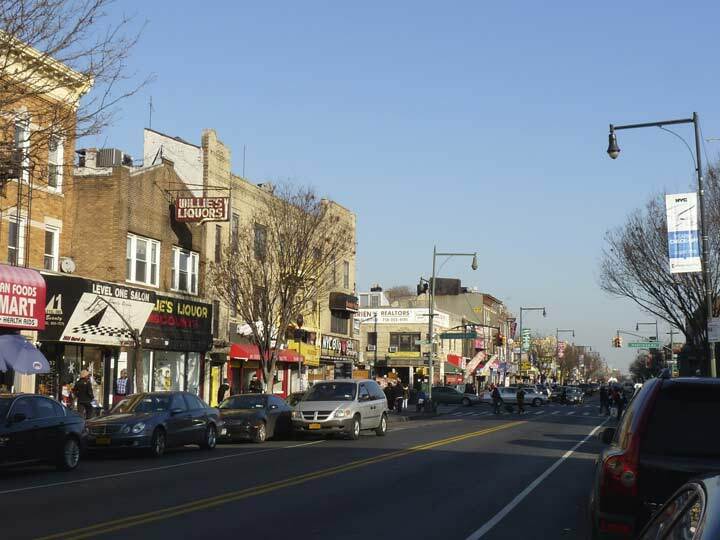 It’s one of Brooklyn’s oldest and longest roads, though it escaped extinction in the 1920s when Boro President Riegelmann (the Coney Island boardwalk is named for him) decided to widen and expand the route east of Ocean Parkway to a 6-lane behemoth. 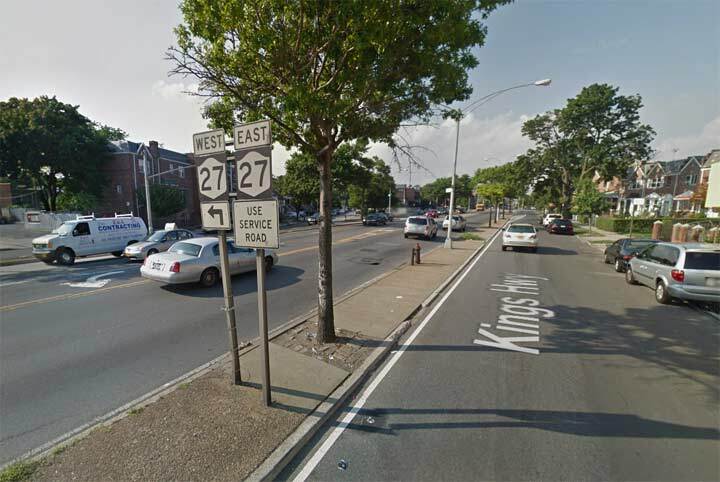 NYS 27 doesn’t run along Kings Highway, but the signs direct traffic to Linden Boulevard a block north, which does. Church Avenue at Remsen Avenue. When Rem Jansen Vanderbeek arrived in New Netherland in 1642, he eventually set off a street naming frenzy — he had fifteen children with the surname Remsen, and most had their own descendants. 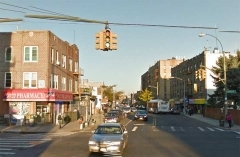 Brooklyn, Queens and Staten Island all have at least one street named Remsen; the longest is Remsen Avenue, which runs in a straight line from Ralph Avenue to Seaview Avenue in Canarsie, standing in for East 90th Street. If you look at a Brooklyn map, Remsen Avenue is the westernmost street in an odd NW-SE grid orientation that defies the primary N-S-E-W grid found hereabouts and contains most of Canarsie. It causes several numbered streets to be skipped — the next numbered street Church avenue encounters after East 59th Street is East 91st! Also, here the Department of Transportation decided, in the late 1970s or early 1980s, to install some square, brown “shoebox” lampposts — the manufacturer escapes me. This is the only occasion in which I saw one of the apices slapped on top of a regulation stoplight. There is a similar run of them on nearby Utica Avenue. … Linden Boulevard, which received its name and its length at about the same time as its brother road, Kings Highway. At the time (the Roaring 20s) Brooklyn was embarking on an upgrade to its surface roads in the nascent automobile era. 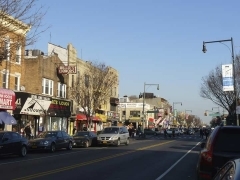 Thus, Linden Avenue, which begins at Flatbush Avenue, was extended east in new sections and overlaid on older streets, such as Vienna Avenue in East New York and eventually, Central Avenue in St. Albans, Queens. 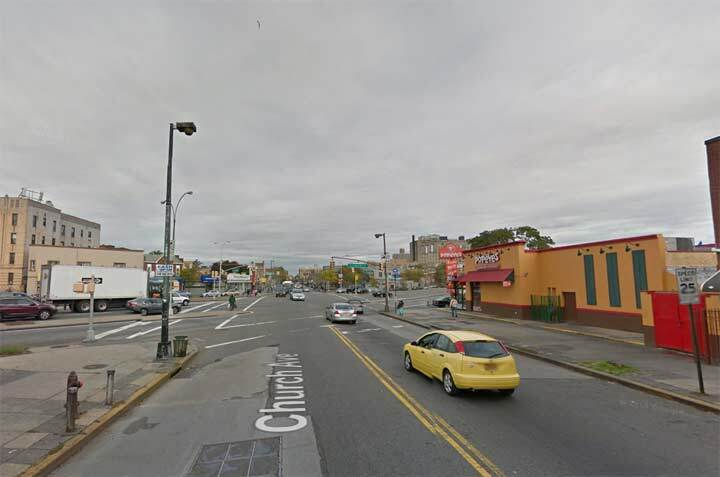 Linden Boulevard eventually hands Route 27 over to the Belt Parkway and was planned to run through Ozone Park, but most of its sections there, except for a couple of stubways, were never built! When I encountered this Deco-ish building on Street View at Church and East 94th I knew it had to possess some kind of importance in the past. 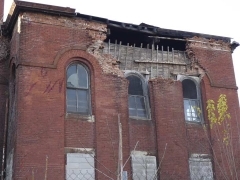 Sure enough, this is the remains of the former Waldorf Theater. Even ciematreasures.org knows not much beyond that the theater opened in 1934, hence the Deco design, and had closed by 1956. If any old timers remember it, the Comments floor is open. At Rockaway Parkway is another stumper. Theater, restaurant, or both? If anyone remembers, let me know. All roads end somewhere and Church Avenue ends here at East 98th Street between Lott and Hegeman Avenues in the Brownsville street plan. 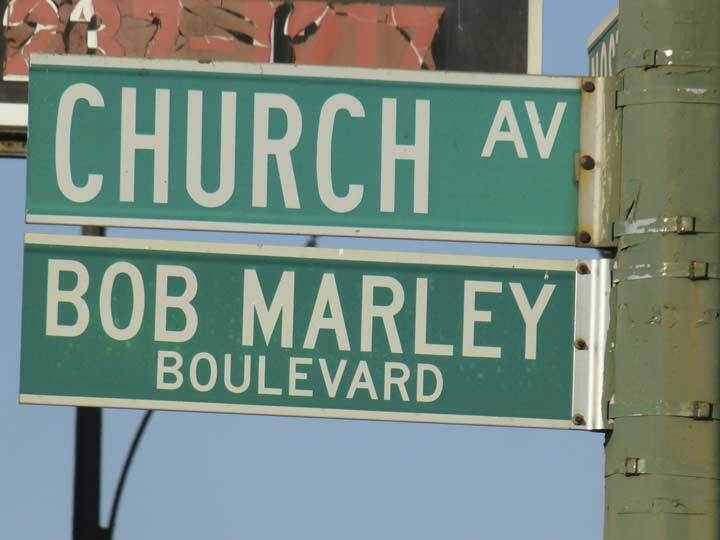 Note the Bob Marley Boulevard sign – the other one was encountered about 40 blocks to the west. Nearby Brookdale Hospital, seen here at its Rockaway Parkway entrance, serves a vast area — East Flatbush, Brownsville, Canarsie and East New York. It opened in 1921 as the Brownsville and East New York Hospital and acquired its present name in 1963. From 1932 to 1963, Brookdale was Beth-El Hospital. Kevin, a good resource when trying to determine the original use of a building is the NYC Department of Building’s own website at http://www.nyc.gov/buildings. There, on the left-hand side of the page you will find BIS; the Building Information System. Enter the borough, the house number and the street name and you will be able to see the documents that the DOB has on file for that building. 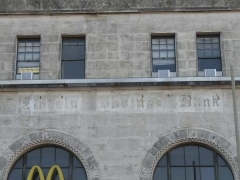 Try looking up the building’s C of O (Certificate of Occupancy). All buildings built beginning in the early 1900’s have a C of O which lists, in general terms, the use of the building floor-by-floor. Buildings built prior to that time may not have a C of O unless it has undergone a renovation that was major or changed its use or occupancy in some way. Look for the C of O with the oldest date. You can also look for a TCO (Temporary Certificate of Occupancy) which would predate the full C of O. 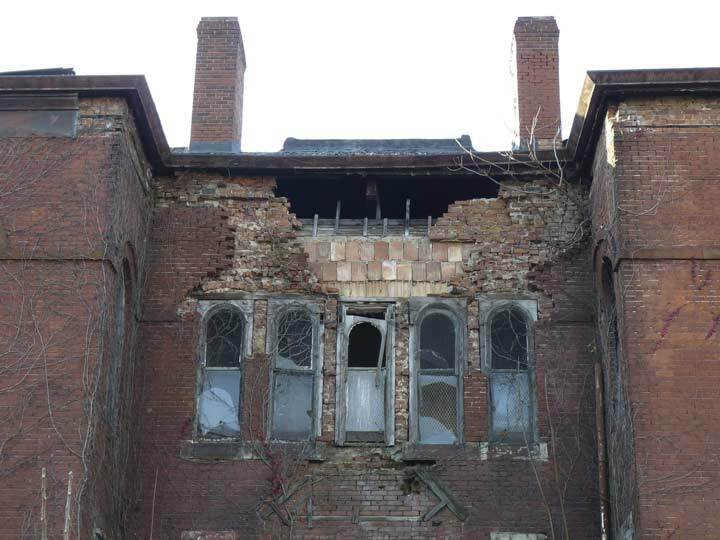 Be aware, however, that records for older buildings can be spotty, as the DOB was notorious in the past for ‘misplacing’ files (and, admittedly, some of us architects requisitioned files that were not returned). Now all filings are done electronically. 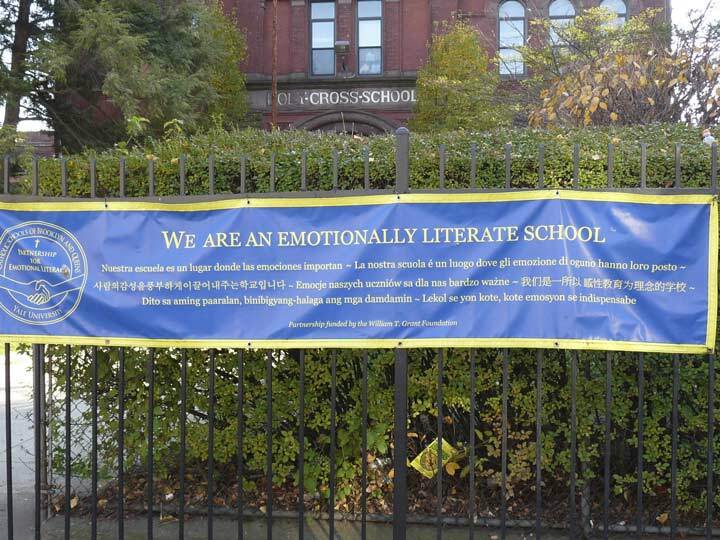 I grew up in that area.I seem to recall that old PS 90 was some sort of “special” city school but never had it explained why……it was right around the corner from Erasmus and across the street from that Flatbush PO station….Holy Cross School was highly respected in the area…. 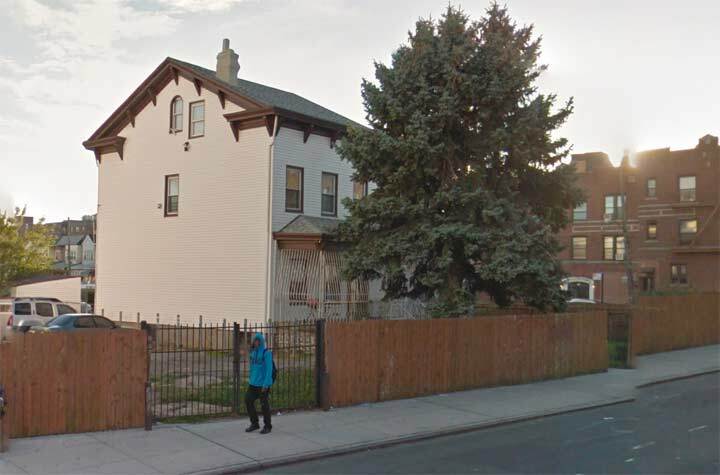 The building at Church and Brooklyn Avenues was the Maher farmhouse, according to my parents who grew up in the neighborhood in the ’30s. The farm was long gone by then but they remembered Mr. and Mrs. Maher sitting on their porch greeting everyone who passed by. 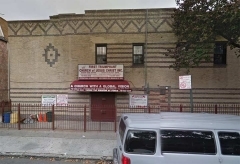 I think the building at Church Avenue and Rockaway Parkway was a funeral home, possibly I.J. Morris, through the early ’70s. Yes! The building is the I J Morris funeral parlor. I lived a few blocks away from it and passed it every time I walked over to Church Avenue. You will see that the IRT under Nostrand Ave. was, in those days, called the “Nostrand Ave. Line.” Then it became the more pedestrian #2 and #5 lines. 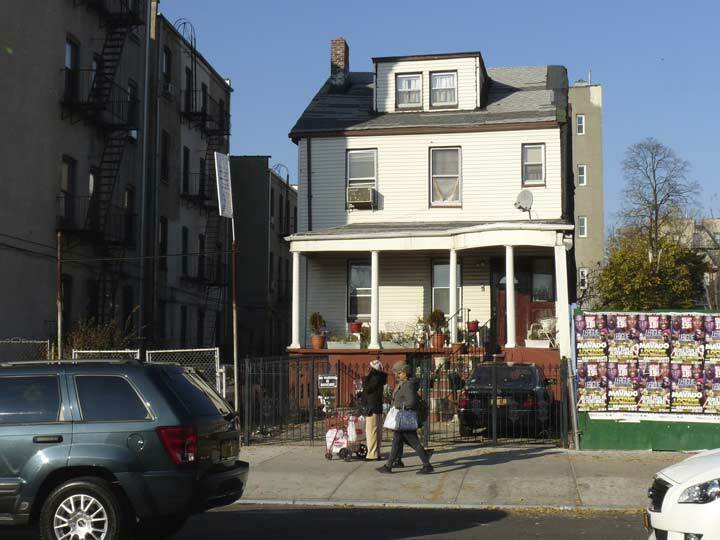 On the corner of Rockaway Parkway and Church sits the former home of I.J. Morris funeral parlor. Closed in lates 60’s or early 70’s. Bldg was taken over by Brookdale Hospital. Another I.J. 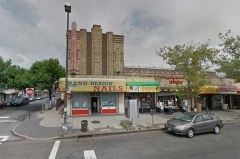 Morris funeral home was located on Coney Island Ave (land of a thousand funeral parlors). The Waldorf Theater closed in the 50’s and the bldg was occupied by a carpet outlet store for many years. Brookdale was known as Beth-El hospital until the 60’s, when the Brookdale Corp, along with Arnold and Marie Schwartz gave big time donations. 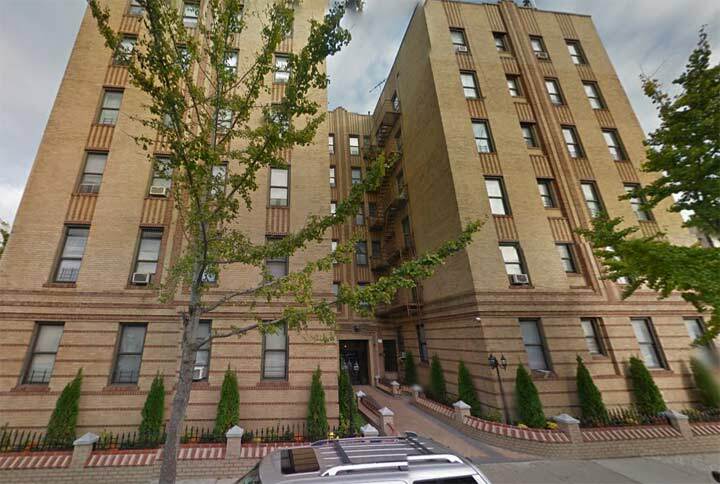 Brookdale Hospital now occupies a great many bldgs in the area (apartment houses, private homes, stores, etc. 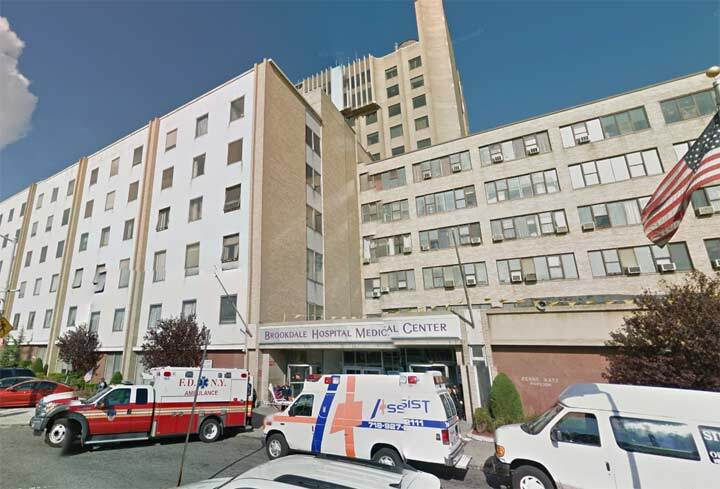 At once a highly praised and highly rated hospital, it now is one of lower rated institutions in Brooklyn. You are right about I J Morris Jewish Memoria Funerall Director . A bit of history about it: They handled the Julius and Ethel Rosenberg’s funeral in 1953. I remember the procession going down Church Avenel that day. Before Beth-el Hospital became Brookdale it was Brooklyn Maternity. Avenue C actually runs down the lobby of Brookdale Hospital … and right off the lobby … where the restrooms are … memorial plaques with all its names are on display. Huh. That advice about CofO was right on. Started looking into 9701 Church. It was built in 1937 as a dance hall/cabaret. By 1945, it had become a funeral parlor. So I wonder if the filled-in windows on the upper floor might originally have been glassed. In 1975, Morris Bros funerals sold it to become the Brookdale Hospital Nursing Home. 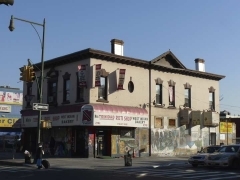 Can’t believe you didn’t mention the Granada theater near Church & Nostrand! There was a Ray’s Food Shop next to The Granada for many years. Ray’s was a subsidiary of Bickford’s Cafeteria chain all over NYC. 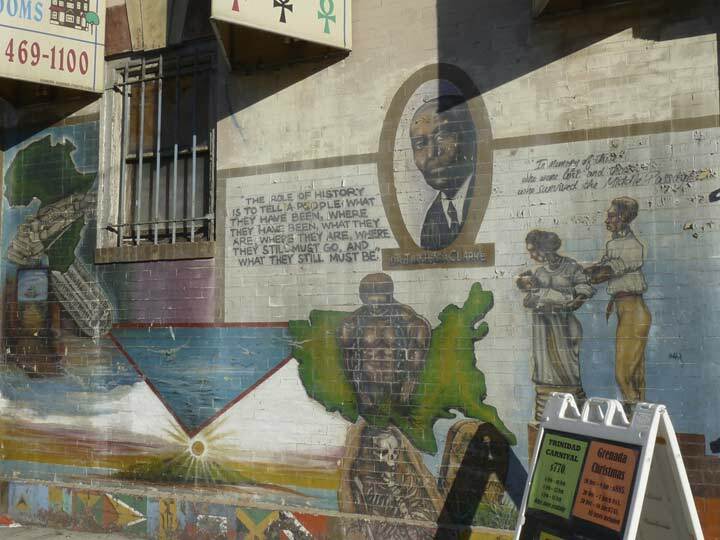 The portrait on the right in the multi-figure mural wear a crown is Haile Selassie, Emperor of Ethiopia 1930-1974. He claimed direct descent from King Solomon. Considered the returned Messiah by the Rastafari Movement in Jamaica. not sure about all of the images in the painting, but definitely Stevie Wonder, Halie Selassie, Ida Wells Barnett and maybe Harriet Tubman. I think the figures along with Marcus Garvey, Bob Marley, and Malcolm X might be Haile Selassie (top right), and Sojourner Truth (bottom, 2nd from right). 1) Brookdale Hospital was known as Beth-El. Some staff members sarcastically dubbed it “Beth Hell”. 2) The Lincoln Savings Bank at Church and Nostrand was a beautiful old-style bank. 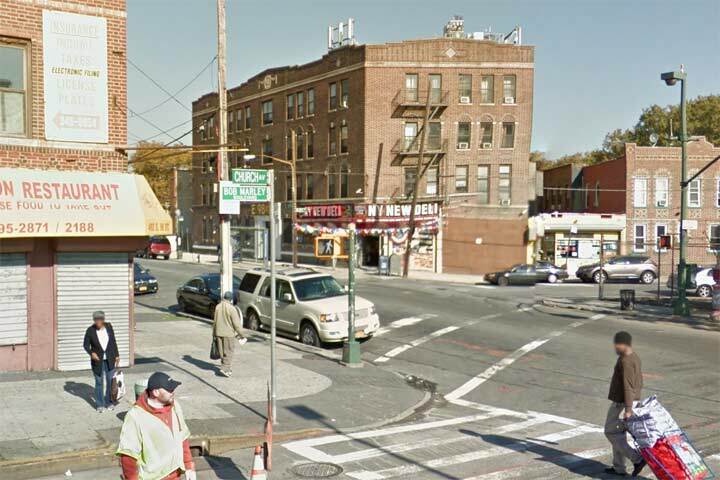 When I came to Brooklyn at age 13 (1961) that’s where I had my first NY savings account. I’m sorry that it wasn’t put to a better use than fast food. At the corner of Rockaway Pkway and Church Ave. was a Jewish funeral home. The infamous convicted Russian spies that were executed. The Rosenbergs funeral was held there. I remember seeing films of of the funeral procession for the Rosenbergs…. 9701 Church Ave, was I J Morris Funeral Home. 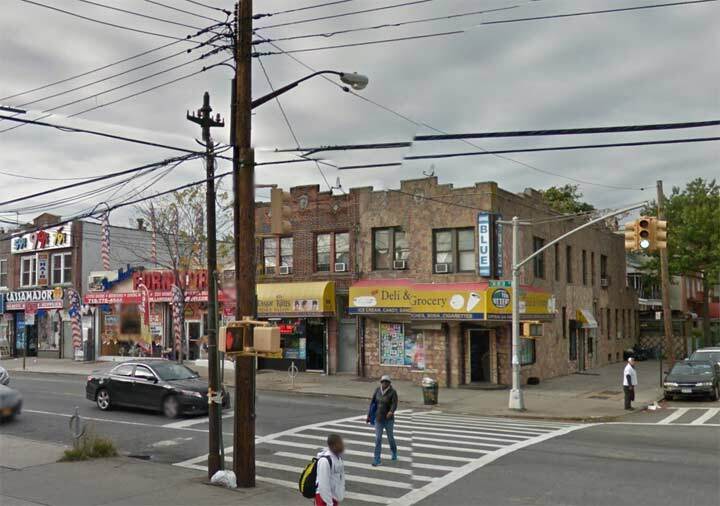 It later moved to Flatbush Ave, just north of Kings Highway. The Church Ave I J Morris Home was where funeral services for Ethel and Julius Rosenberg were held. 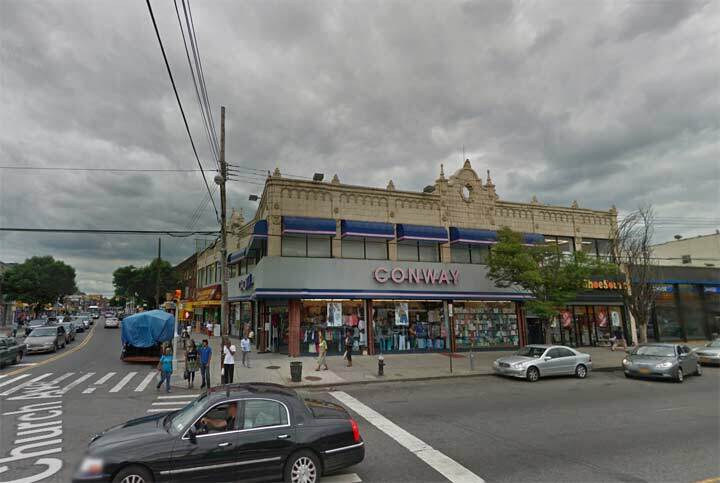 I believe the photo of Conway’s on corner of Church & Utica was an Army-Navy Store, where we all went for Peacoats, the stiff black double breasted wool jackets we loved as kids and teenagers. Also, white sailor hats we thought we looked cool in. Across the street on Church was a large drug store, Silver Rod’s. Life was sweet then. 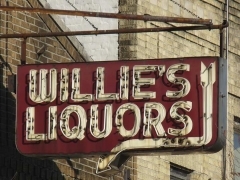 Your remark at Schenectady Ave about spelling reminded me of my youth in the 50’s in Brooklyn. Whenever my aunt came up from the Washington DC area to visit us, and we took her around in our ancient Ford, she inevitably asked me “So Larry, how do you spell ‘Schenectady’?” I eventually learned it correctly and she stopped asking. A great dissertation on Church Ave. I even remember the trolleys and their special tunnel under Ocean Parkway and wonder what future archaeologists will make of it. 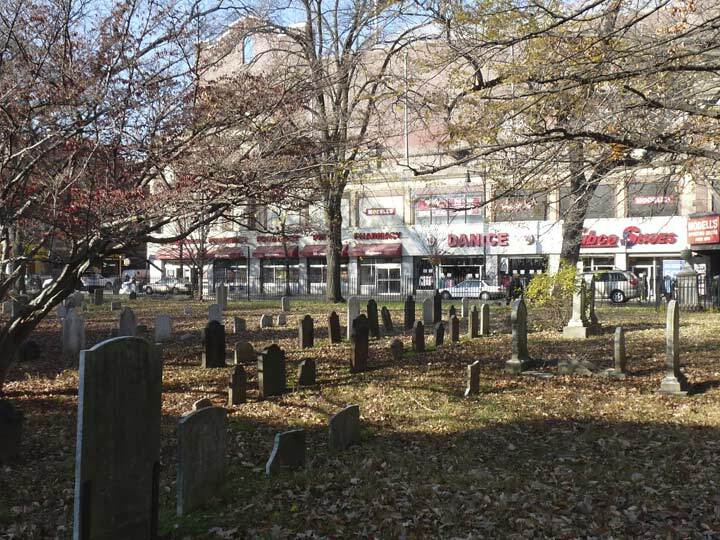 OMG…Kevin, do I have a cemetery story for YOU! As a kid in the 60s, my Mom would sometimes take me with her to her job when there was no school, at a Dr’s office in a beautiful Victorian on Rugby between Church & Caton. One beautiful summer afternoon, I decided I’d visit my elderly, never-married, bird loving Aunt in her Ocean Avenue studio a few blocks away. As it wasn’t a Sunday with Lawrence Welk on TV, I knew I wouldn’t be interupting anything. Atop her TV sat that $1.99 brown bakelite, ball-base, rabbit ear antenna, which she used well into the 80s. Coincidentally, she bore a passing resemblance to Art Linkletter, another one of her “heroes”. 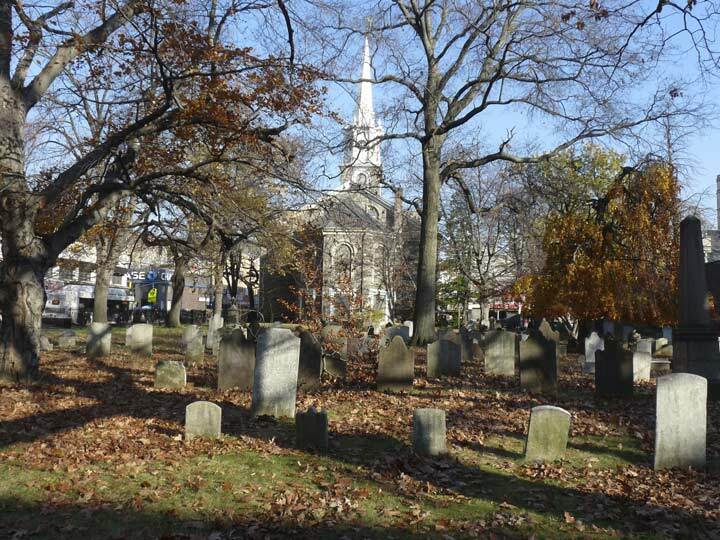 What ensued was a comedy of errors – First, with her key breaking in her apartment door lock, then forgetting she still had 1 pink roller in her hair, & culminating with a trip to none other than the good ol’ Dutch Reformed Cemetery (which was my idea). No sooner did we enter when one of her stockings got caught & ripped on some thorny brambles. “HERE LYETH [male name], WHO DIED SHORTLY AND MYSTERIOUSLY AFTER VISITING THIS SPOT”. It was dated from the 1700s, if I recall correctly. That’s all we needed to see; without any words spoken between dear Auntie & I, we high tailed out of there ASAP. I was incredulous that sbe could run so fast. Whether this was an 18th century practical joke, I couldn’t say. 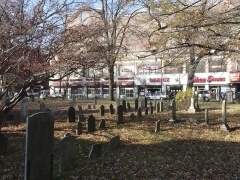 But lest you think I’M the one joking, by all means, please go there & see for yourself: It’s very close to the Church Avenue & East 21st Street corner of the cemetery. Thanks for allowing me to share this truly unforgettable episode from my Brooklyn childhood! The old house just past Beford you mentioned looked like it had been there since the village days, is quite literally half the house it used to be. 2411 Church Avenue used to be. 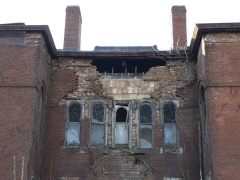 A number of years ago, in order to split up the lot apparently, they chopped the house in half as crudely as you can imagine doing such a thing. The slab sided eastern wall of the house shows how it was butchered. It was a grand old house prior to that. I did some digging, and found several old pictures of the neighborhood from the early 1900’s, which seems to be just after the area was parceled out for residential use. The trolley line predates pretty much everything except the farmhouse at Brooklyn Avenue. There’s a shot from E. 35th street where you can see the farmhouse, the curb (seems the sidewalk was poured later on) and the trolley, and nothing but empty lots as far as the eye can see. Kind of cool/creepy to be able to see what your neighborhood looked like before it was a neighborhood at all. I used to go to the Waldorf Theater every Saturday. There was always a double feature, about eight cartoons, a Buck Rogers, Flash Gordon or Boston Blackie serial, eight coming attractions and lots of noise from the audience. I think admission in the late 1940s was a quarter. A matron in a white nurse’s uniform patrolled the aisles telling the kids to shut up — which they did until she passed their rows. I saw “African Queen” there as well as countless Randolph Scott and Joel McRae westerns. Yes, 9701 Church was I J Morris Memorial Chapel. 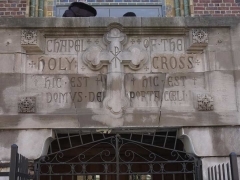 The original chapel was established in Brownsville and they moved into this location in the late 1920’s. This was purposely built to use by funeral service professionals and had a full-sized Chapel and numerous slumber-rooms. A fully modern preparation room for embalming ( yes, back in the day most Jewish funeral homes embalmed everybody!) And a room for ritual preparation. 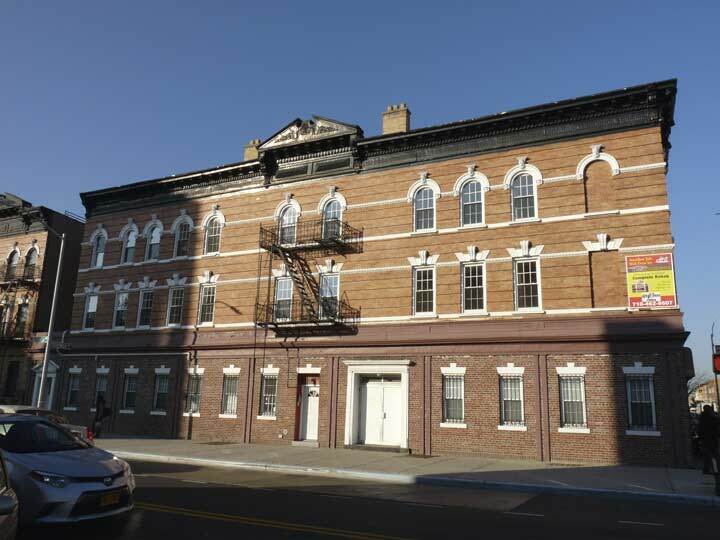 The Morris family ran a first-class operation and at one time was the busiest funeral service in Brooklyn. Sadly, like many others in NYC, the firm was sold off to one of the large and greedy, and insensitive publicly funded, for -profit corporations. All that remains of the once proud company is the name. The Morris’ are all gone. Great history of I J Morris. Our family lived near there From about 1930 to the late 60’s. My father new the Morris family well. Did a lot of business with them through his Farain. If you check out this vintage footage of the Church Avenue trolley by Periscope Films, you will see a brief 5 second glimpse of the funeral home on Church and Rockaway, at 10:53: https://www.youtube.com/watch?v=ZcL9nVShr48&t=1247s. I believe part of the building is now a dialysis center. I’m not sure; have to go out there and look around. We are moving to the area soon from a. few miles away. I appreciate this rich and vibrant account of Church Ave’s past and present as seen through your keen eye. Thank you for this gift as we prepare to familiarize ourselves with a new Brooklyn neighborhood and to be a part of its emerging story. I grew up at 45 Martense St (quite an Art Deco palace) around the corner from the Ellsworth building in the ‘50s. There was a luncheonette on the corner where the deli is now, my father would send me there Sunday to fetch the paper. 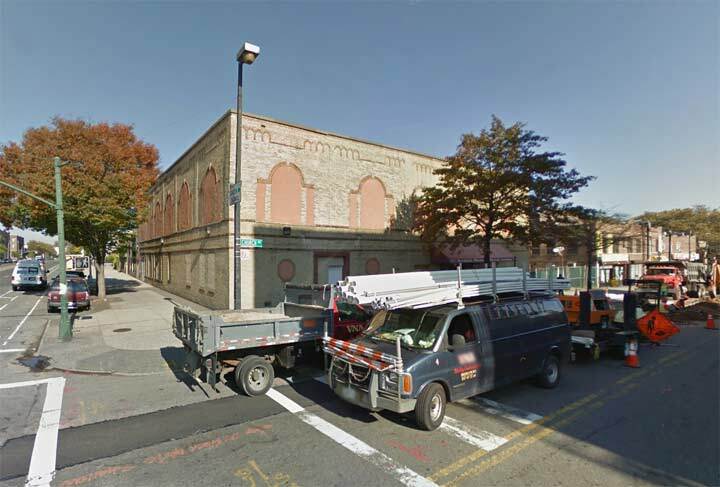 Towards Flatbush – “the ave” – was the post office the Democratic Party headquarters and the fire station. The Republican headquarters, in an old mansion,was down Church in the other direction towards Holy Cross. Saw JFK at Flatbush and Church when he was campaigning. 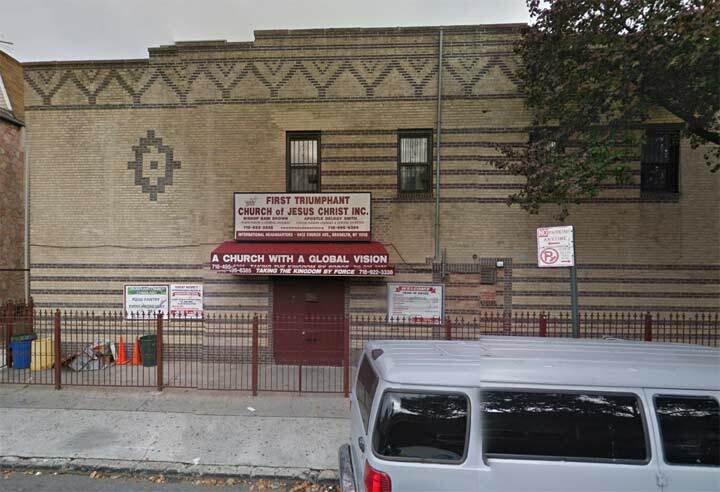 In the 1940’s, 9701 Church was a catering hall. I think it was the Colonial Manor(?). On the opposite odd numbered corner was a pharmacy. The pharmacist lived upstairs. He had a daughter, Carol, who married a dentist, Sidney Henner. He moved to Deer Park in Suffolk County. Kevin and Ed, I lived on East 37th and Church and remember the house that I always suspected was a farmhouse. Any place I can find some info and photos about it? ?